Place bananas in a blender and puree until smooth. Add in eggs and pulse just until combined. Lightly grease a skillet with butter. Place over medium heat. Drop batter onto skillet to resemble bunny shape as shown in photo. 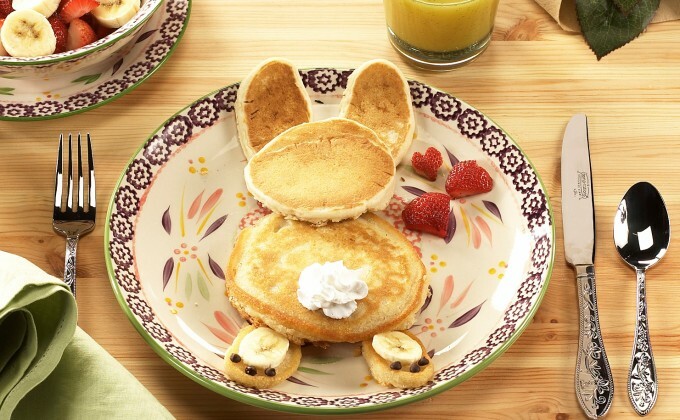 Once pancakes are done, arrange in a bunny shape on each temp-tations® plate. Decorate with whipped cream for the tail, a banana slice for each foot and mini chocolate chips for toes. Serve with butter and syrup if desired.